From all locations in the continental U.S., baggage can be picked up directly at the camper’s home and transported to camp. You will need to arrange for this service directly through our baggage company: Camp Trucking, Inc. (www.camptrucking.com: 970-949-0690.) If you do not hear from Camp Trucking by May 15th and you wish to use their services to transport your daughter’s baggage to camp, please contact them directly. Camp Trucking will be communicating with you directly regarding all tags, other necessary information and baggage pick-up dates. Should any baggage problems or questions arise, you should contact Camp Trucking directly. For parents in locations that Camp Trucking does not service (i.e., outside of the continental United States), we recommend using UPS or FedEx. You will need to arrange for both baggage drop off and pick up with UPS or FedEx directly. We are equipped to receive baggage beginning Friday, June 14th. All baggage should be in camp by Saturday, June 22nd. Please make arrangements for UPS baggage to be picked up at camp on Tuesday, August 13th. We will have a truck at Albany airport on opening day to transport baggage arriving with campers by plane. Trunks and duffle bags should have the camper’s name written or embroidered in large letters for easy identification. If you are using your own lock on any baggage, please send an extra set of keys or a copy of the lock combination to our office before Camp. Please label all keys with your daughter’s name and group. All keys will be returned to you at the end of Camp. The baggage of Ti through Jr. B campers will be unpacked for them prior to their arrival. NOTE: Please do not have campers carry large pieces of luggage on the buses either to or from Camp. Everything should be packed in the trunk or duffle except for some games, books, or a special stuffed animal that your daughter may want to have on the bus. Please complete the Transportation and Baggage Form in your CampMinder account by April 1st so we can make appropriate arrangements for your daughter’s travel to and from Camp. 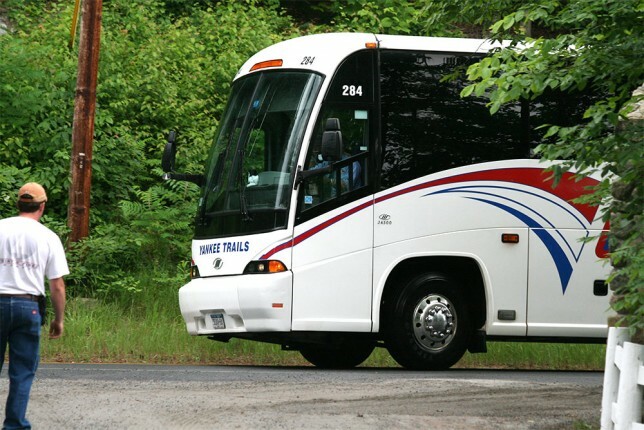 Coach Bus – We coordinate coach bus transportation to/from camp in the following locations: New York City, Westchester, Long Island, New Jersey, and Philadelphia. Timing and location details for coach bus locations are listed in the Transportation and Baggage Form in your CampMinder account. Car – Parents are welcome to drop off campers on opening day and pickup campers on the last day of camp. Timing details will be provided closer to arrival/departure dates to avoid conflict with the coach bus arrival/departure times. Changing Assigned Departure Point: Please make any changes to your daughter’s transportation and baggage plans on the Transportation and Baggage Form in your CampMinder account Forms Dashboard. Please be certain your daughter dresses in Camp Uniform (navy shorts or jeans, camp uniform shirt and sweatshirt). Please check the weather forecast to determine if a rain jacket is necessary. Provide your daughter with a picnic lunch and a drink. We will supply more drinks and dessert later during the bus ride. Please be prompt – we recommend that you arrive at your daughter’s bus departure point 45 minutes before the scheduled departure. Sign-In: There will be a responsible Camp representative in charge of departure. Register your child and have her go directly to her assigned bus with her baggage. Please limit hand baggage. It is difficult for the girls to handle, and space is limited. Mark everything very clearly with your daughter’s name. Please stay back from boarding area after your daughter boards the bus. This will help the departure process and eliminate confusion and unnecessary strain on the campers. Your cooperation is most important and will be appreciated. Please smile and say a quick “goodbye,” as this will facilitate a smooth and happy departure. Campers will return home on Tuesday, August 13, 2019. In August, you will receive an email notice confirming your daughter’s transportation home from camp.